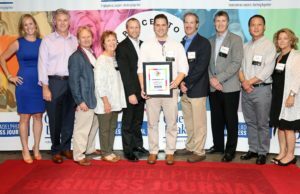 Malvern, PA, August 9, 2018 – VenatoRx Pharmaceuticals today announced that it was named one of the “2018 Best Places to Work” in the Greater Philadelphia area by the Philadelphia Business Journal. Team members from VenatoRx accepting the Best Places to Work 2018 Award at the Fillmore in Philadelphia. Founded in 2010, VenatoRx has grown from three founders to over 50 employees who are heavily comprised of entrepreneurial-minded scientists and operators who have had career success in big pharma and start-up environments. Headquartered in Malvern, PA, VenatoRx operates in a 25,000 square foot facility comprised of both laboratory and office space. To date, VenatoRx has invented multiple series of novel anti-infective agents and has filed over 30 patent applications. The Philadelphia Business Journal, in partnership with Quantum Workplace, honors companies based on a scoring benchmark which reflects employee response rates as well as employee rankings of work environment, people, personal growth, and professional development. The year 2018 yielded a record number of applications for the Best Places to Work and every company included had to reach a scoring benchmark. Led by a world-class team of pharmaceutical veterans, VenatoRx is a private pharmaceutical company that is developing a new wave of anti-infective products to address increasing medical needs. VenatoRx’s lead product, VNRX-5133, is an injectable broad-spectrum beta-lactamase inhibitor (BLI) that directly inhibits all four Ambler classes of beta-lactamases. Early clinical studies of cefepime/VNRX-5133 have been completed and VenatoRx plans to start Phase 3 pivotal trials in the second half of 2018. In addition, VenatoRx has a broad pipeline of preclinical programs, including a broad-spectrum orally bioavailable BLI, a novel class of Penicillin-Binding Protein (PBP) inhibitors that are impervious to beta-lactamase-driven resistance, and novel antiviral agents. For more information, please visit www.venatorx.com.